The driving motivation behind this project was to make me look cooler at parties when all I have is a TV screen and an aux cord. I used a Pmod MIC as the sound sensor, and had it connected to the Arduino Uno. I then ran the data collected through the serial port to a program in Processing, which displayed the gain levels as "bars" in real time. Side Note: This Processing program also serves as a good testing/graphing tool for any kind of data passed to it through the serial port. With the help of my friend Josh I was successful at creating a program that visualized the sound in the way that I had envisioned. As for the primary goal the results are still to be determined regarding whether people think that I do in fact, know how to raise the roof. A screen capture of the program in action. For use with the Pmod MIC circuit. Upload this code to your board first, and keep it connected to the computer before attempting to launch the Processing code. If you are stuck feel free to peek at the serial monitor in the Arduino IDE to make sure it is sending data. The normal numbers I was getting when I did this were around 2000-2200. 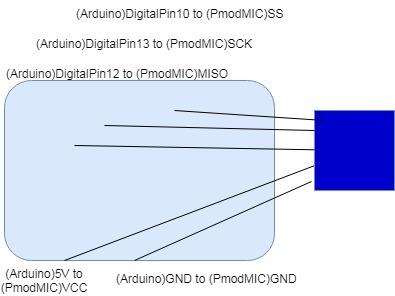 Run this after you have connected the Arduino and MIC circuit, and uploaded the PmodMIC code. If you are having issues with it selecting the correct serial port, change the  on line 25 to a . * Description: Reads serial data and displays it as a bar graph. int scale = 10; // Value to divide the serial values by. Larger values results in a shorter graph. // delay(100); //optional delay to slow speed of bars for better visual effect. Thanks to Joshua Cummings .